Imagine a gene that comes in two variants, where one of them is deleterious to the carrier. This is not so hard to imagine, and it is often the case. Most mutations don’t matter at all. Of those that matter, most are damaging. Next, imagine that the mutation happens over and over again with some mutation rate. This is also not so hard. After all, given enough time, every possible DNA sequence should occur, as if by monkeys and typewriters. In this case, since we’re talking about the deleterious mutation rate, we don’t even need exactly the same DNA sequence to occur; rather, what is important is how often a class of mutations with the same consequences happen. 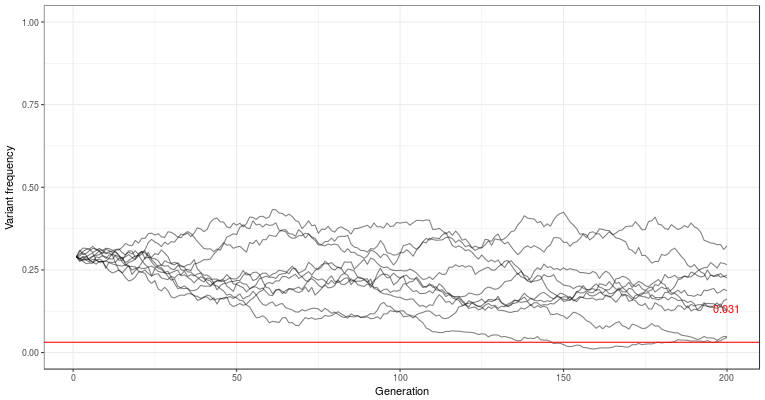 This is supposed to show the trajectory of a deleterious genetic variant, with sliders to decide the population size, mutation rate, selection, dominance, and starting frequency. The lines are ten replicate populations, followed for 200 generations. The red line is the estimated equilibrium frequency — where the population would end up if it was infinitely large and not subject to random chance. Damaging variants tend to be recessive, that is, they hurt only when you have two of them. Imagine an enzyme that makes some crucial biochemical product, that you need some but not a lot of. If you have one working copy of the enzyme, you may be perfectly fine, but if you are left without any working copy, you will have a deficit. We can describe this by a dominance coefficient called h. If the dominance coefficient is one, the variant is completely dominant, so that it damages you even if you only have one copy. If the dominance coefficient is zero, the variant is completely recessive, and having one copy of it does not affect you at all. The average reproductive success (”fitness”) of each genotype is described in terms of selection coefficients, which tells us how much selection there is against a genotype. Selection coefficients range from 0, which means that you’re winning, to 1 which means that you’ve been completely out-competed. For a recessive damaging variant, the AA homozygotes and Aa heterozygotes are unaffected, but the aa homozygotes suffers selection coefficient s.
for aa. We can think of this as the probability of contributing to the next generation. What about the red line in the graphs? If natural selection keeps removing a mutation from the gene pool, and mutation keeps adding it back in again there may be some equilibrium frequency where they cancel out, and the frequency of the damaging variant is more or less constant. This is called mutation–selection balance. I’ve changed his notation a bit to use h and s for dominance and selection coefficient. is the mutation rate. It’s not easy to see what is going on here, but we can draw it in the graph, and see that it’s usually very small. In these small populations, where drift is a major player, the variants are often completely lost, or drift to higher frequency by chance. Haldane, J. B. S. ”The effect of variation of fitness.” The American Naturalist 71.735 (1937): 337-349.